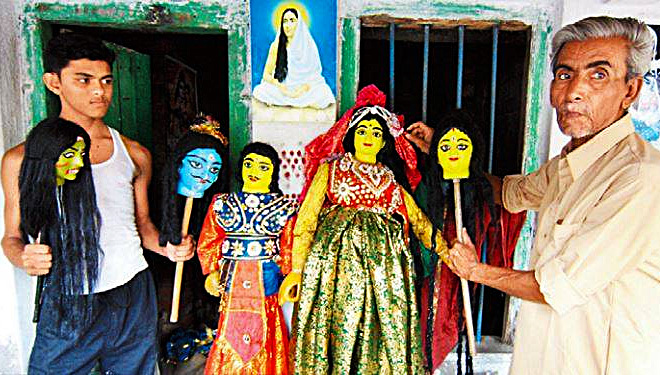 Except Darjeeling and Purulia, traditional rod puppetry existed in all the other districts of West Bengal. Today, on the verge of extinction, it exists mainly in South 24 Parganas - no more than about ten groups across a few villages in the district. The rod puppeteers, who are usually landless farmers, move from village to village, performing at fairs and are rarely to be seen in urban areas – unless specially invited, perhaps to a government sponsored event. Some of the families have been carrying on this art for generations together – as much as 100 years or more. Most of them are illiterate. 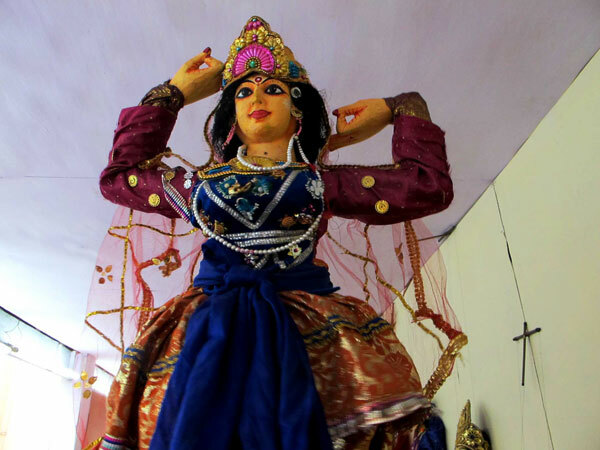 The traditional rod puppet form of West Bengal is known as Dang Putul Naach or Dange`r Putul Naach, where dang means rod and putul describes both a doll and a puppet. This is a puppetry tradition that goes back to the 14th century and its emphasis is more on drama than dance. There is a great influence of the jatra (a traditional theatre form of Bengal) tradition in this form of puppetry – in the costumes, themes, script and enactment. About three to four feet in height, the Dang Putul (or Dange`r Putul) of West Bengal is realistic in design. 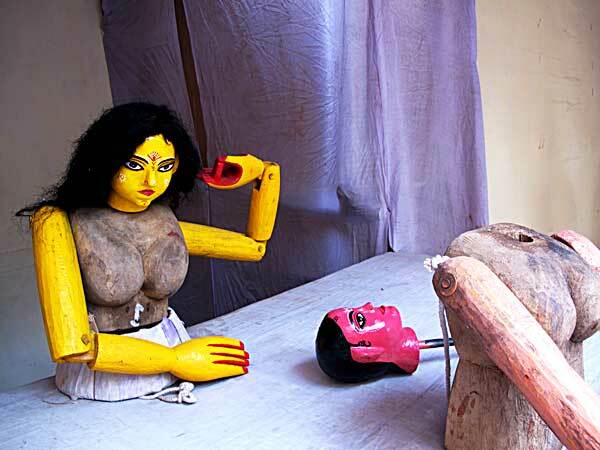 The body of the puppet is carved out of wood and then painted and can weigh between 5 to 15 kgs. The face is coated with a clay-and-cloth layer and then painted. The puppet is then clothed in bright glittering colours and textures. There is a hole in each hand of the puppet so that a sword or bow or mace can be inserted – depending on the character of the puppet. The joints on a puppet’s body will also depend on the character it is to play. Most dolls have a joint on each shoulder and at one elbow. A dancer (Nachni) will have additional joints at the second elbow, left wrist and waist; a Krishna will have a joint on the right leg; but generally speaking, puppets have mostly three joints – and do not have legs. The head is mounted on a rod or pole, which is then inserted through the body at the neck. Both arms are manipulated by a single string attached to a rod that spans the shoulder and acts as a lever. The same puppet can be reused for different acts with a change of costume. The performance of these rod puppets takes place on a makeshift stage which is spanned by a 1.5 metre high curtain over which the puppet performance can be seen. A painted backdrop is often used. Traditionally, the lighting was provided by Petromax lights but electric lights are being increasingly used. The puppeteers, each holding one puppet aloft, stand behind this head-high curtain and while manipulating the rods also move and dance imparting corresponding movements to the puppets. Not all puppeteers dance. The ones who manipulate the non dancing characters are called Nariye (movers). 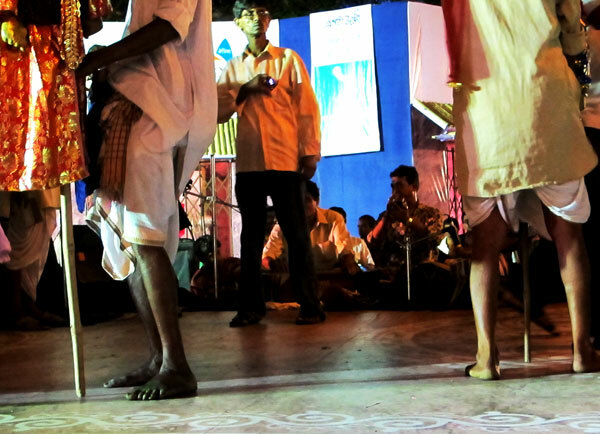 The dancing puppeteers or Nachiye wear bells around their ankles and dance, keeping time with the rhythm of the song. 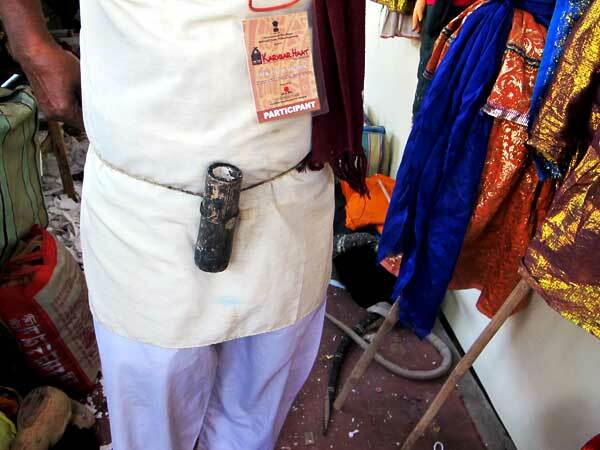 The Nachiye`s task is specialized and he will not hold any other puppet. There is only one Nachiye per group. The singers are often the puppeteers themselves or there is a separate person singing and delivering the stylized prose dialogues. A group of musicians, sitting at the side of the stage provide vocal support and the accompanying music with instruments like harmonium, flute and percussive instruments like the Dhol, Tabla, Kanshi (brass plate struck with a wooden stick) and Kartal (cymbals). The use of microphones has now become common. Both music and dialogue are usually very dramatic, in keeping with the jatra style. To save costs, pre-recorded music is often used these days.  This means that the musicians don`t have to accompany the troupe. As in the jatra, before the puppet play actually begins, there is a long musical overture, which both announces the show and attracts people from afar. The themes are traditionally Puranic, with stories of Ram and Sita or Radha and Krishna, but historical and social themes have also been used. Gaining ground are social messages being propagated by the local government. These are usually of half hour duration, on themes ranging from AIDS, education, sanitation etc and are providing the troupes that remain with the hope of a reasonable income. The puppeteers always work as a team and the various activities are shared out among 15 or more people: the puppet manipulators (nariyes), those providing instrumental support; the chorus singers and the main singer (the Sur Master). There is also a manager who is usually the owner of the group. A show could extend up to three hours, though newer trends reflect a demand for shorter plays. Once the show is over, the puppets, with the movable parts separated, are stored carefully, the faces wrapped with cloth to avoid any damage and the costumes boxed away for the next performance.